Immerse yourself in a Full Day of Activities which includes the Dolphin Swim program. 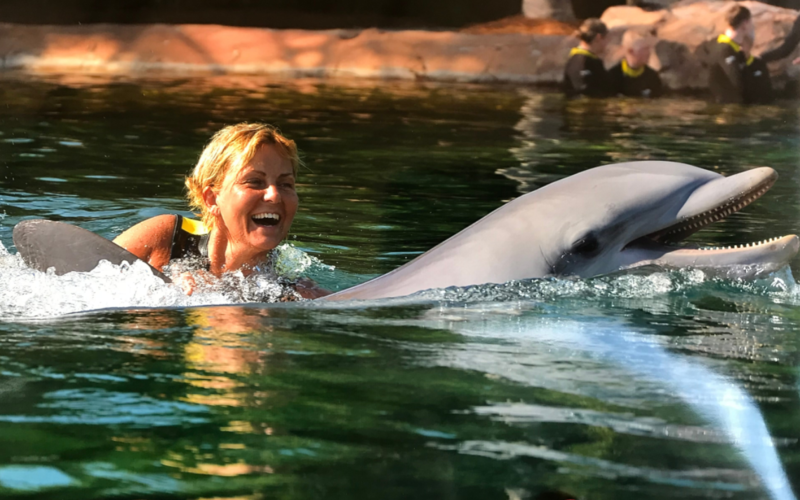 With this exclusive Orlando activity, you will have a chance to swim with dolphins and explore a man-made tropical reef, private beaches with plenty of lounge chairs, plenty of fun for the young and old that will put a smile on everyone’s face. Don your swimming gear and frolic all day in the water and be with the bottlenose dolphins and all their aquatic friends. Relax and take time to enjoy all the wonders that Orlando’s Discovery Cove has to offer you. A 30 minute shallow and deep water experience including touching, playing and training with a dolphin. 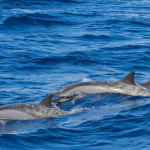 You will also swim into deeper water and will get a dolphin ride across the water with a dorsal fin ride. 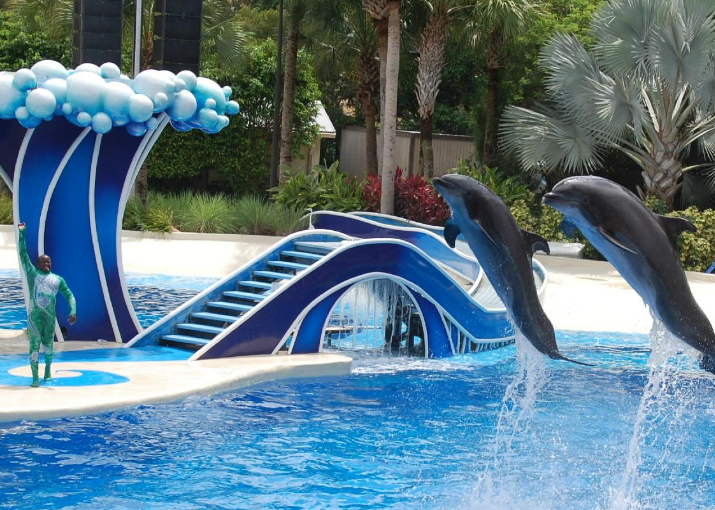 For the non-swimmer, you will be able to substitute your dolphin ride for an extra shallow water behavior. 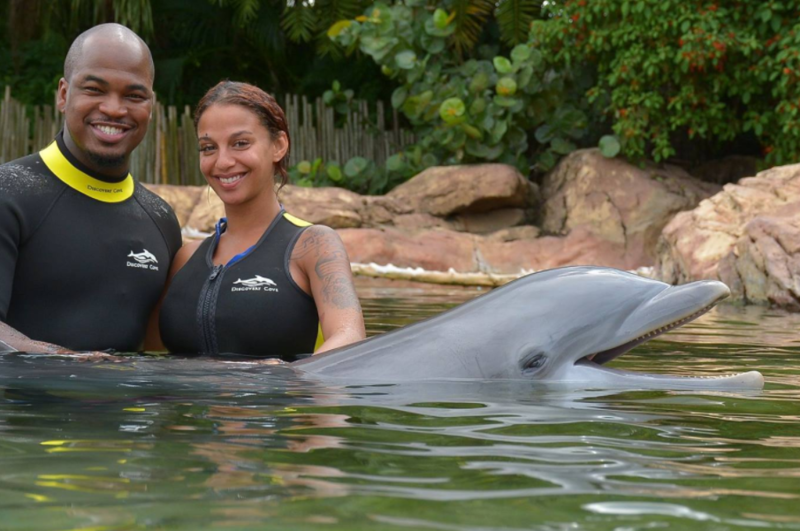 Personal photo & video opportunities with a dolphin to purchase afterwards. A wetsuit and life jackets will be provided. Snorkel among thousands of tropical fish and rays. Come eye-to-eye with sharks through a 10-foot-tall panoramic window. 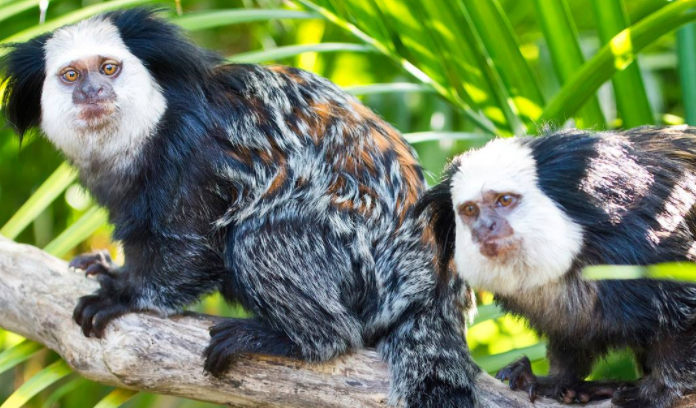 Encounter playful otters, curious marmosets, and hand-feed exotic birds. Enjoy white sandy beaches and freshwater grottos. Float along a scenic crystal-clear river. Freshly prepared breakfast and lunch . Unlimited snacks and beverages, including alcohol. Observer, Day Resort Guests, get to do everything except go into the water or touch the dolphins. Any Participant within 6 – 12 years old, must have a paid Adult participant (An Adult is anyone 18 years or older). Open Most Days a Year. The time slots are first come, first serve. The Swims start at 10am and are every 1/2 hour during the day. If you arrive late, you will be given the last time slot of the day. No check in after 1pm. We recommend to arrive early to enjoy everything that park has to offer. This is a FULL day of activities. The Dolphin Facility is next to Sea World Orlando with easy signage to find from all major highways and roads. You will get complete written directions with your online ticket. Driving Times: These times are approximate from the location listed below to Sea World / Discovery Cove area, depending on traffic and weather conditions. Free Bus and Van Transportation Available from Sea World Resorts. You can get the best rates in the Fall Month. You will click on the booking calendar to see the best deals you can get. To Get a 5% Rebate check – you need to call to make your reservation. You need to need to mention the 5% rebate check in order to get this promotion. You must bring valid ID to get into the park. What is the address of Discovery Cove? Are reservations required to spend the day at Discovery Cove? Since Discovery Cove limits attendance to about 1,300 guests per day, it is highly recommended you make a reservation for your visit. Also, if you are planning on visiting during the summer or near a holiday, you should book your reservation at least two months prior to your intended visit to ensure availability as these timeframes tend to book early. Once you have made a reservation, you simply check in on the date of your visit. All you need is your name, confirmation number, and a photo ID for those guests over the age of 18. If Discovery Cove is a Day Resort, does that mean this includes an overnight stay? Discovery Cove is a day resort as it is an all-inclusive day where meals, drinks, gear, and activities are included once you check in for your day of discovery. For information on overnight accommodations, please see our Hotel Packages options. 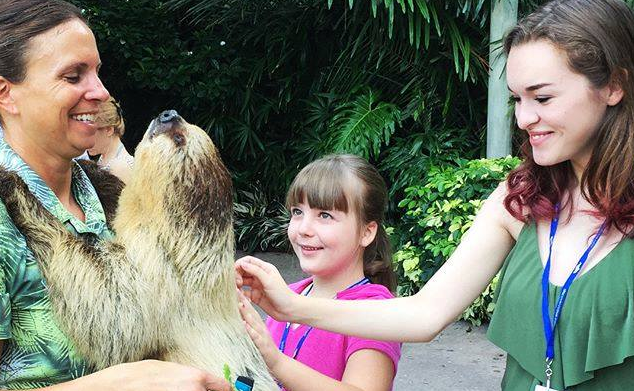 Guests of all ages are welcomed at Discovery Cove. Children ages 6-12 must be accompanied by a paying adult who also is participating in the dolphin swim experience. This policy was established to ensure the cognitive and physical stature of the child. These factors are taken into consideration to ensure children are able to interact in a group social setting, accept instructions, and understand the trainer. Also, the physical size of the child is taken into account since he/she will be in water that is approximately 3 feet deep with large, powerful animals. Unaccompanied minors must be at least 14 to participate in the Trainer for a Day program with an accompanying adult in the park with paid admission. Must be 15 to enter the park without parental supervision. Parent or Legal Guardian must sign “Authorization to Treat” forms before allowing park entry. All Minors participating in the Dolphin Experience must have any and all release forms signed by a parent/legal guardian over the age of 18. Any guest under the age of 18 participating in the SeaVenture experience must have liability waiver signed by parent or legal guardian after watching the instructional video. Why is the Day resort price the same for adults and children? Since children are able to participate in all of the park’s activities, we do not offer a children’s rate, however, toddlers age 2 and under do receive complimentary admission. What is included with my admission? The Day Resort Packages at Discovery Cove are all-inclusive. Therefore, admission includes the use of lockers, wetsuit, towels and mask during your stay, free parking at Discovery Cove, shower amenities, souvenir snorkel, breakfast, lunch, drinks and snacks, access to the Explorer’s Aviary, The Grand Reef®, Freshwater Oasis®, Serenity Bay, and Wind-Away River. Our guests select in which activities they would like to participate. At this time, we do not offer customized packages for guests who chose not to participate in selected activities. Do I need to be a good swimmer to participate in the various experiences at Discovery Cove? Even for non-swimmers, Discovery Cove has plenty to offer. Not only can you relax on the white sand beaches or one of our many hammocks, but we have an Aviary full of exotic birds to hand feed. More importantly, however, we do provide life jackets so you can enjoy the waterways as well. 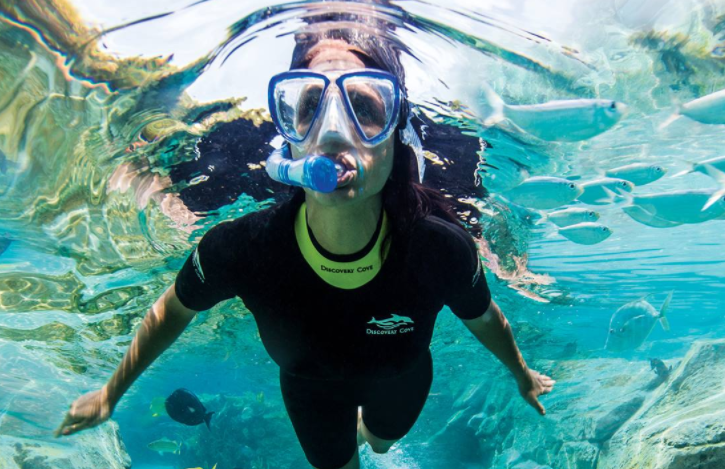 The devices are designed to keep you afloat, so you would still be able to snorkel with the fish in The Grand Reef® or take a journey down our Wind-Away River. The lifejackets can even be worn in the dolphin lagoons! The in-water dolphin experience is 30 minutes long. 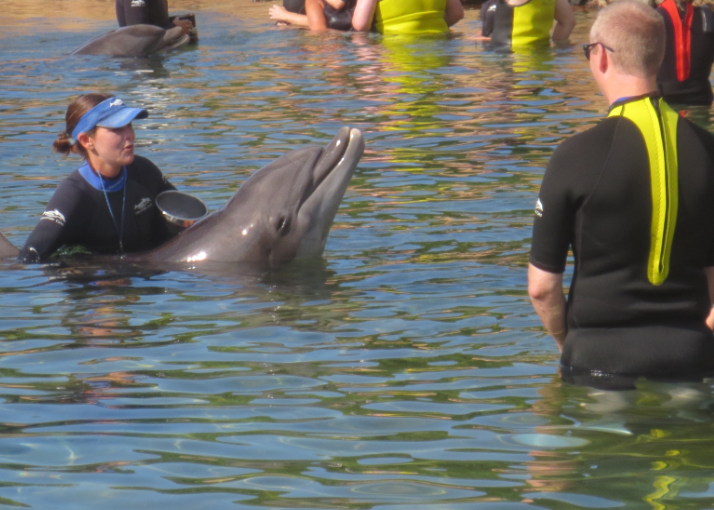 Beforehand, there is a short orientation session (10 minutes) led by Discovery Cove’s expert dolphin trainers to discuss safety and offer an opportunity for participants to ask questions. Next, small groups wade into the shallow water of the Dolphin Lagoon for the in-water experience with the dolphins. At the end, one at a time, guests and a trainer will swim into deeper water for a personal “dorsal tow” back to shore. After the water experience, guests can view photographs and video of their interactions and talk about their experience with trainers and other participants. What are the operating hours for Discovery Cove? 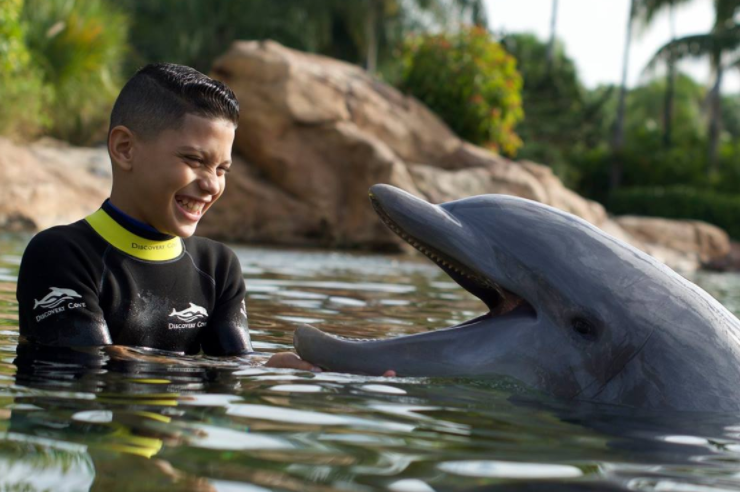 Discovery Cove is a full day adventure with operating hours of 8:00 a.m. – 5:30 p.m. daily. Check-in begins at 7:15 a.m. If you’re participating in 3 or more add-on experiences during your visit to Discovery Cove, please plan to arrive by 7:30am for check-in and proper scheduling of your day. If your participating in Ray Feeding and your visitation date is between March 12 and November 4, please plan to arrive by 7:00 a.m. If your visitation date is between November 5 and March 11, please plan to arrive by 7:30 a.m.
Where can I view a map of Discovery Cove? Please click HERE to view the map of Discovery Cove. Guests should bring their own swimsuits, and, if they choose, water socks or rubber pool shoes, hat, sunglasses and cover-up or dry clothes. Guests participating in the Trainer for a Day program are required to wear footwear during some portions of their day. Discovery Cove provides all guests with swim vests and/or wetsuits. With the exception of watches and wedding bands, Discovery Cove guests may not wear jewelry, for the safety of the animals. Discovery Cove provides a mask and snorkel, towels and beach chairs. Guests may use their own masks and snorkels, if they prefer, but may not bring any other diving or swimming equipment into the park. Discovery Cove will also provide guests with a sample of specially formulated sunscreen that is safe for use in the animal habitats. Since meals, snacks and drinks are provided with admission to Discovery Cove, no other food, beverages or coolers are permitted. Guests may wish to bring books and magazines, a music player with headset or similar items to help them relax on the beach, and a camera to catch all of their special moments. Are cameras and recording devices allowed in Discovery Cove? Guests may use their personal cameras and recording devices throughout the park, with the exception of the Dolphin Lagoons and Shark Swim (for the safety of our animals and your photo equipment). We do allow other party members to take photos and video of the interaction from our beach areas. In addition, we provide photographers and videographers to capture your memories. Photography and video packages vary in selection and pricing. What is the temperature of the water in the pools? The temperature of our pools remains constant throughout the year. The fresh water Serenity Bay, Freshwater Oasis and Wind-Away River are maintained around 85-86 F (30 C). The salt water Dolphin Lagoon and The Grand Reef® is maintained around 76-77 F (25 C). While in the water, we do require guests to wear either a wetsuit (short or long depending on the season and guests preference) or a swim vest. This ensures our lifeguards are able to see guests as they swim underwater, thus, enhancing safety. *Sizing ranges from toddlers through 18XL. What should the air temperature be like during my visit? Are there any restrictions for expectant mothers? We do not place restrictions for expectant mothers; the decision is left up to each individual. However, guests should take the following into consideration: the day will involve swimming with water depths ranging from 3 feet to 15 feet. In addition, if you have chosen to participate in the Dolphin swim experience it will be with a live animal weighing in excess of 500 pounds. 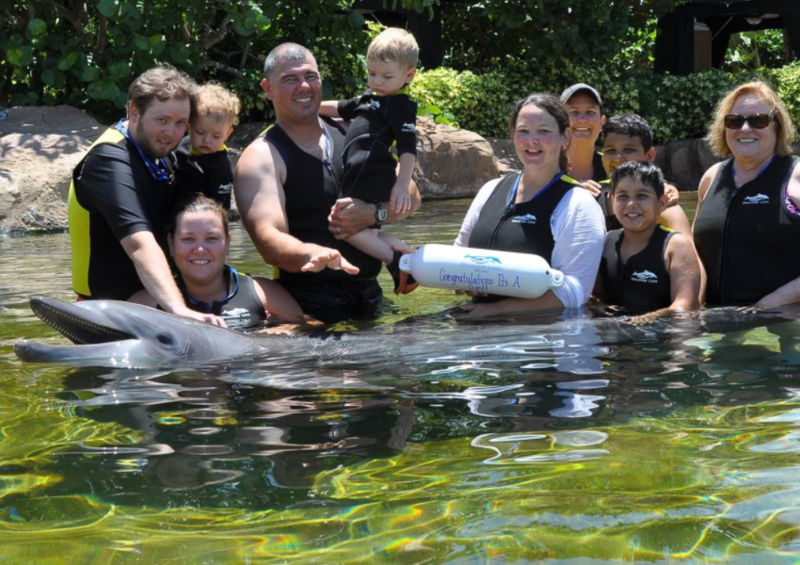 The experience will involve up-close activities such as kissing and touching of the dolphin, along with being towed 12 feet through the water while holding onto the dorsal fin of the dolphin. Therefore, we do ask that you consult a doctor prior to your visit. Please ensure that you explain the nature of the interaction and activities to receive a proper assessment. Are there any age restrictions for unaccompanied minors? 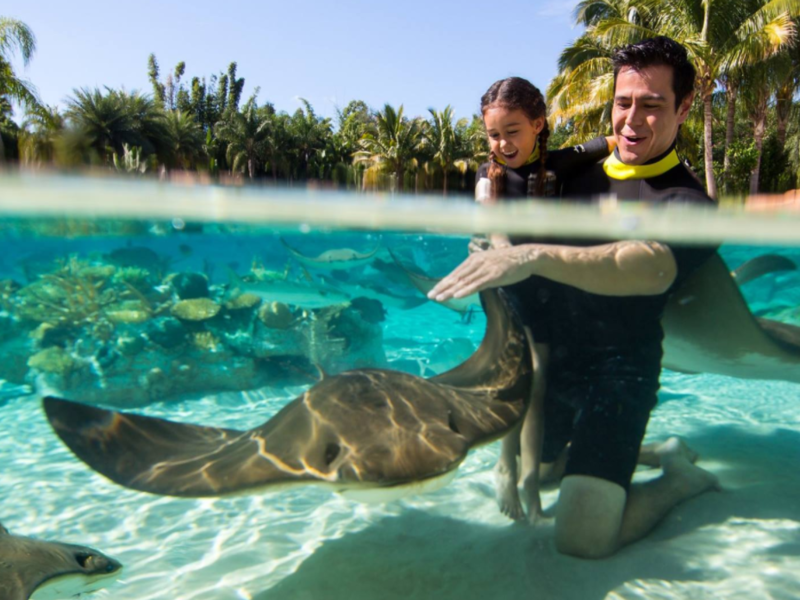 SeaWorld Parks & Entertainment suggests that visitors 14 and younger be accompanied by an adult when visiting Discovery Cove. • Minors 15-17 visiting alone must have parent or legal guardian sign “Authorization to Treat” forms before allowing park entry. 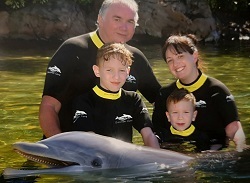 • All Minors participating in the Dolphin Experience must have any and all release forms signed by a parent/legal guardian over the age of 18. • Any guest under the age of 18 participating in the SeaVenture experience must have liability waiver signed by parent or legal guardian after watching the instructional video. 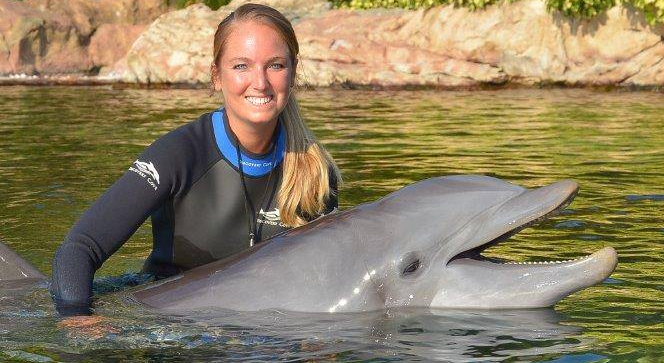 Includes: All Inclusive Dolphin Swim Program – A 30 minute shallow and deep water experience includes the following: a ride with a dolphin, hugging, touching, petting, kissing, and playing with the Dolphins. Plus, Educational Briefing, Snorkeling with thousands of tropical fish and rays, Encounters with playful otters, Hand feeding exotic birds, Relaxing on pristine beaches, Complimentary breakfast and lunch and unlimited snacks and beverages throughout the day. Must be 6 years old and up. Book Now! This was by far our favourite day in Orlando!!! We had a cabana overlooking the grand reef which was just beautiful! The lady (can't remember her name sorry) was very attentive and kept our fridge stocked all day full of juice, wine and beer and loads of snacks also!!! We were so blown away with the dolphin swim! We were super lucky to have the pleasure of meeting Roxy and Capricorn and they were just beautiful!!!! So gentle!!! You can tell straight away the trailers have a great relationship with the dolphins and they appear to be very well looked after! This truelly is a little slice of paradise and will definitely return again!